Published Sept. 21, 2014 in the Wyoming Tribune Eagle. Let’s talk about growing grass today—or what folks in the landscape business call turf—and what you need to do to prepare a conventional, Kentucky bluegrass lawn for winter. I asked Martha Mullikin, a Laramie County Master Gardener, to describe her lawn maintenance schedule. She has a large lawn, large for being located in the older part of town. It is where famous local architect William Dubois (1879-1953) once had a tennis court. It’s large enough to host large weddings and other parties—which Martha has. And now that he’s retired, that work falls to her husband, David. It’s available locally. Without chemicals, it introduces microorganisms that break down organic materials in it to make nutrients available to plants. “We don’t use the weed killer-fertilizer combinations because I compost grass clippings,” Martha said. Otherwise, if the clippings aren’t set aside for a year, the residual herbicide will kill flowers and vegetables in gardens treated with the compost. After the final lawn mowing, she uses a “winterizer” fertilizer, one that is designed to be slow-release—you wouldn’t want a big hit of nitrogen to encourage the growth of tender little grass blades right before winter weather. It is equally important to read the directions on the packaging and apply the right amount of fertilizer and make sure it doesn’t get washed into the street. Wasting fertilizer wastes your money and pollutes streams and groundwater—where someone—if not you—gets their drinking water. In some patches of Martha’s lawn, she has white clover growing. Clover is a nitrogen fixer, acting like fertilizer, so if it were growing with your grass all over your lawn, you could reduce the amount of nitrogen you use. 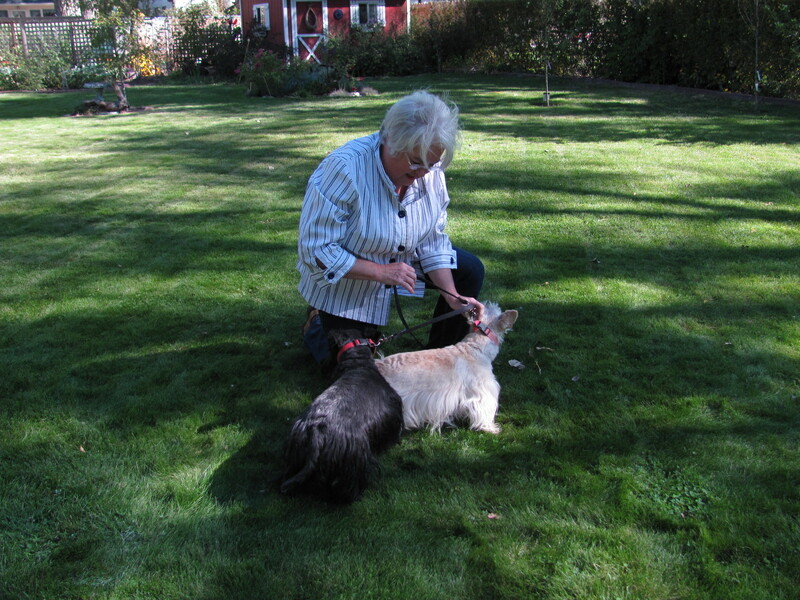 Martha usually digs dandelions and other weeds, seldom resorting to weed killer for persistent spots. Every time the above-ground parts of a weed are removed, the weed’s ability to feed its roots through photosynthesis is lessened, eventually starving it, and hopefully killing it, just like cows do when they continually graze their favorite plants. Dealing with weeds on an as-needed basis rather than broadcasting weed-killer over your whole lawn means you save money and might get a sweet surprise, such as little violets blooming in your turf. Martha has a well for watering, but pumping it has a cost as does using our municipal water. So it makes sense to be as efficient as possible. Using a sprinkler system like Martha’s means you can set it on a schedule. But that schedule needs adjusting based on how rainfall and summer heat affect how fast your lawn dries out. The length of time an individual zone runs depends on how hot and dry it is compared to the others. What you want to do is soak the top 12 inches of your yard. This is where most of the tree and shrub roots are, and where the grass roots should be reaching. Lightly watering often will keep roots too close to the surface where they may dry out and die. Plus, wetting a lawn too often encourages diseases. Catherine Wissner, University of Wyoming Extension horticulturist, suggests one last deep watering before the ground freezes to benefit turf as well as trees and shrubs. Also plan to water your yard if we have any of those long, dry spells in winter when it is warm enough to set out a hose and sprinkler. But don’t forget to drain or blow out your sprinkler system before water in the pipes can freeze. Martha suggests using the lawn mower to pick up leaves with the grass catcher. “You have to get rid of those leaves or you will have snow mold,” she said. Considering leaf mulch can be used to keep down weeds in the garden, you can see how detrimental it might be to a lawn. The snow mold, a fungus, breaks down the leaves—and your grass. The nice part about using your lawn mower is that you will be mixing grass clippings with dead leaves—a desirable combination of green and brown materials for composting. Also, small bits of leaves decay, or compost, faster than whole leaves. If you don’t have compost bins, use plastic leaf bags, leaving the tops open so moisture will be added by rain and snow. Or dig the chopped leaves into your annual flower or vegetable garden. For protecting perennial flowers, I’ve found it’s better to use whole leaves that are curled and dried—but not cottonwood leaves that remain flat and form an impenetrable layer. After the killing frost, add a foot or so of the curly leaf mulch. In windy locations, keep it from blowing away by laying some wire fencing over or around it. With our long, snowless spells, the grass roots benefit from shading by the grass blades, just as in summer. “David usually mows 3 inches high. The last mow is 3.5 – 4 inches (as high as the mower goes)—pretty high. You don’t want to shock it by cutting it very short,” Martha said. Rather than a weekly affair throughout the growing season, mowing should be done as needed, so that no more than one-third of the height of the grass is removed at one time. Mowing is needed more frequently in spring to keep up with growth, less often by fall. Considering our lawns often get a lot of traffic, including walking back and forth to mow, the soil can get compacted, making it difficult for water and fertilizer to soak in. And all the healthy soil microorganisms need air too. “I really do think aeration helps. We like to do it in the spring right before we fertilize. A lot of places recommend two times a year, but we never have,” Martha said. So try renting one of those core aeration contraptions. Don’t worry about leaving the plugs on the soil surface if you do it in spring like Martha. They will soon break down. If you have a thatch problem, core aeration is better than power raking. Some people replace their lawns with rock and gravel, thinking it will cut back on maintenance. However, dirt blows in on top, allowing weeds to grow, which require pulling or toxic weed killers. Then you have to sift out the dirt out every few years to keep it looking nice. The advantage of a lawn is that all those growing grass plants add coolness and humidity to our homes’ hot, dry summer environments. And all vegetation, including the lawn, helps absorb sound. Lawn maintenance can be a lot of work if you use too much fertilizer and water, making the lawn grow faster than necessary. But there are types of turf, based on native grass species, which require far less maintenance and water. I plan to examine those options early in the spring. Let me know if you have any experience with them. Categories: Lawn care | Tags: lawn aeration, lawn care, lawn fertilization, lawn irrigation, lawn watering, lawn weeds, pesticides, turf, turf maintenance | Permalink.